When I picked out a race to run in Oregon, the choice for me was simple. 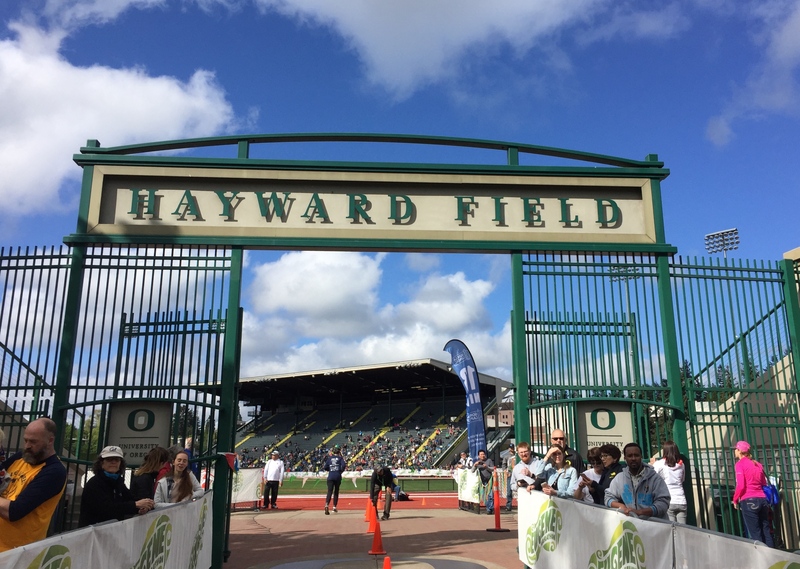 I had to go to Tracktown, USA to run the Eugene Half Marathon, a race that ends on the iconic Hayward Field. This race was definitely one of the most enjoyable races I have run. 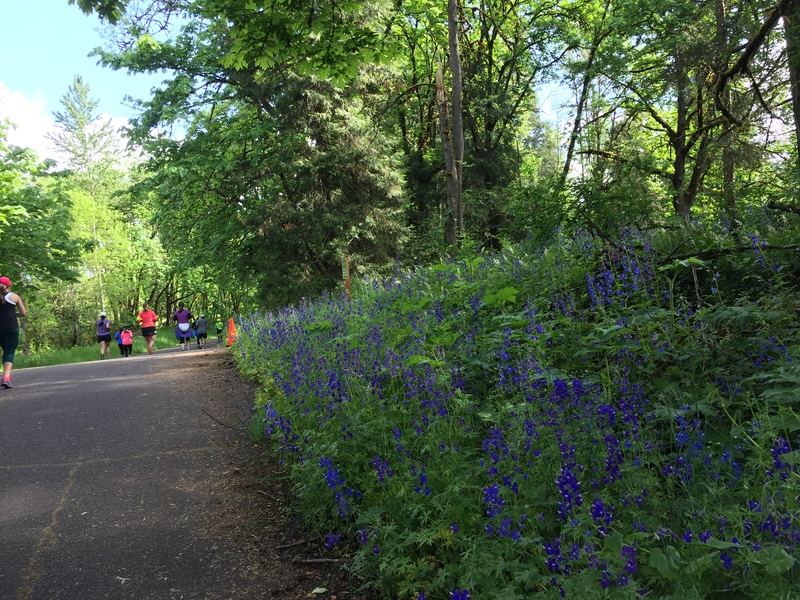 Whether you come to run or not, Eugene is a wonderful place to visit. Located in the Willamette Valley, the scenery is beautiful – foothills and mountains covered in trees and pines, and flowing rivers with ducks and fish. I stopped by the Eugene Saturday Market, a market for farmers and artisans covering two blocks of a downtown park. It was one of the most interesting markets I have ever seen and is reputed to be the oldest market of its kind in the US. There were also plenty of interesting stores to explore as I strolled the downtown streets. The Eugene area is also home to many wineries and craft breweries. I am not much of a beer drinker but I enjoyed tasting the wines from Sweet Cheeks winery at their tasting room in a small downtown mall. Eugene is home to the University of Oregon, well known for their track and field program. Hayward Field is located on the university campus. 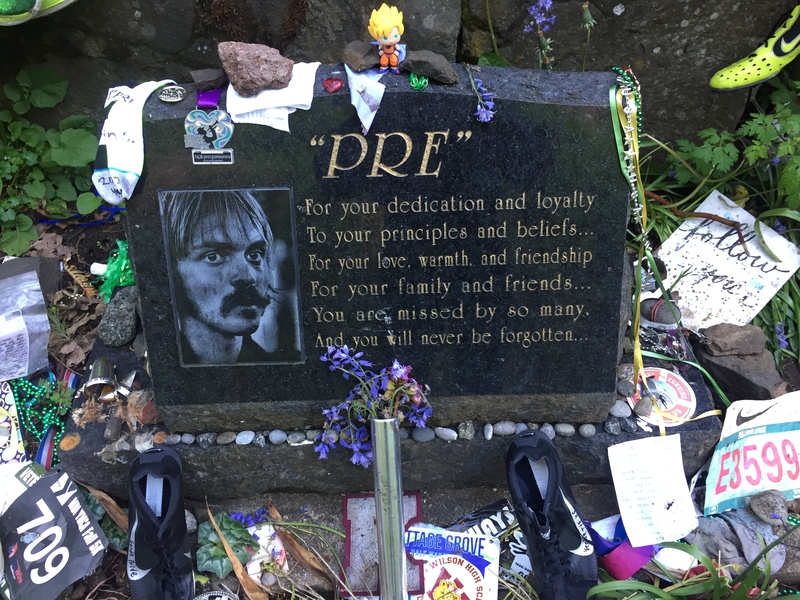 Steve Prefontaine (more commonly referred to as Pre) attended the university and competed in track in middle and long-distance events under Coach Bill Bowerman. Both Bill and Pre are legends in Eugene. Bill was a very successful coach, leading the university to multiple national collegiate championships. He did everything he could to help his athletes improve their performances. That included coming up with improved shoe sole designs using his wife’s waffle iron. His innovations ultimately led to him to co-found Nike with Phil Knight. 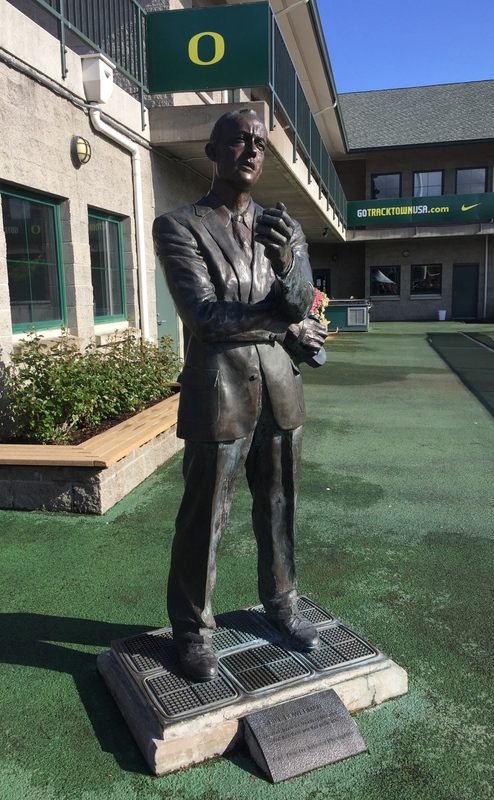 There is a statue of Bill at Hayward Field. The statue rests on a base made to look like a waffle iron. Pre once held the American record in 7 different distances from 2,000 meters to 10,000 meters and competed at the 1972 Summer Olympics. In a race he liked to take the lead early and stay there to the finish line. At the age of 19 he was on the cover of Sports Illustrated magazine, Tragically, he died at the age of 24 when his car crashed into a rock. The spot is now a shrine called “Pre’s Rock”. Runners stop to visit, many leaving their shoes, race bibs, and even their medals to pay tribute to a runner who inspired them. Before I picked up my race bib, I took a quick drive to visit Pre’s Rock. Sunday was race day for the marathoners and half marathoners. For anyone who rode a bike to the start line, they had a bike valet (no worries about keeping your bike safe while you ran). I love race courses in the Pacific Northwest and this one was very pleasant – gorgeous scenery and not much in the way of hills. It is considered one of the best places to earn a Boston Qualifying time. The race was lots of fun too. Spectators had put up fun inspirational signs and people were entertaining the runners including two guys playing didgeridoos. 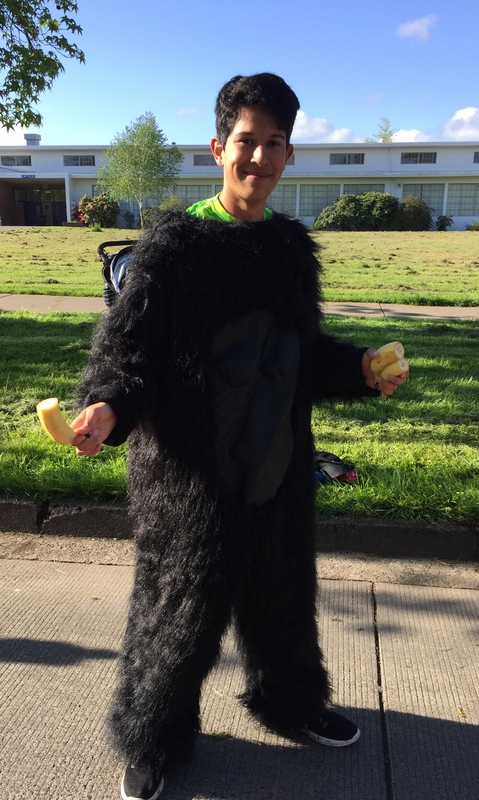 One water stop included people dressed in gorilla costumes (without the head) handing out bananas. Coming onto Hayward Field to finish the race was very emotional. I have never run on a surface as comfortable as Hayward Field. It felt like I was running on springs, very cushiony and very little impact on my tired legs. There were cheering spectators in the stands watching the runners finish. I could imagine how exciting it must be to compete there. There was plenty to enjoy after the race was over too. Runners were handed a reusable shopping bag filled with food and a reusable water bottle. 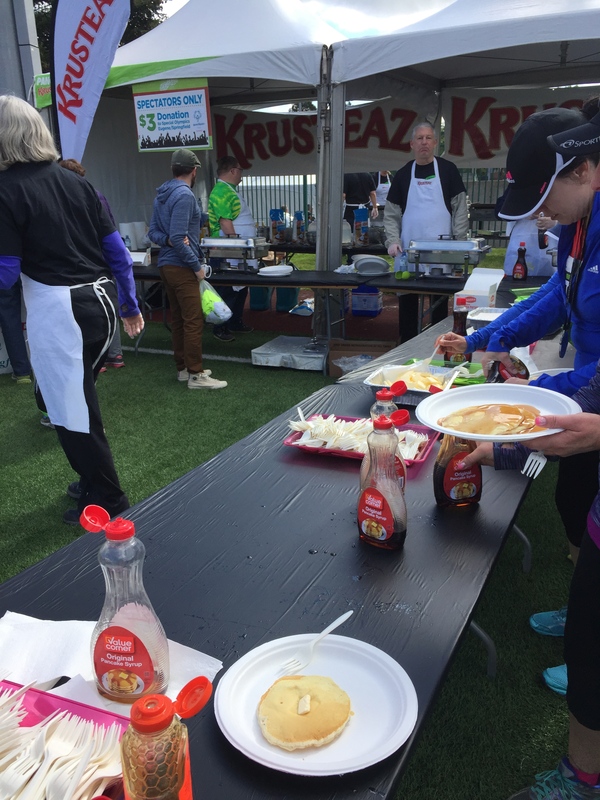 There was a pancake breakfast courtesy of Krusteaz and grilled cheese sandwiches with Franz organic bread. This was the first race where I have had this kind of finisher food and it was wonderful. Every runner I talked to after we finished had the same reaction: we were enjoying the race so much, we hated to see it end. Whether you are running the 50 States or just looking for a different race experience, I highly recommend that you head to Eugene. Nike put out this film about Pre. If you don’t know much about Pre, watch this film and see what Pre was all about.